Will one of these six win Scottish Premiership player of the year? Individual players are coming to the fore. Almost a full season's worth of work can now be assessed, and attention is turning towards the annual awards and who should receive them. Judgements are subjective, and perspective is required since a player can play well in a struggling team, while performing for a winning side can be easier since confidence and assurance flows. Pressure is a consideration too, though, since there are greater expectations at Celtic than at other clubs in Scotland. It is also not a selection of the best players in the country, but those who have consistently performed to the best of their ability or even exceeded what was anticipated from them. So here are six players who ought to be in contention for the player of the year award in the Premiership, and the justification for their inclusion. Rooney has been prolific and is currently the top scorer in the Premiership. The goals were expected from a player who has built a solid reputation at a series of clubs. Even so, his haul has been impressive and contributed significantly to Aberdeen's brief title challenge. A powerful and hard-running front man, he has led the line with versatility, being able to run beyond opposition defences with pace, to spin into the channels, or to drop deep to involve himself in the build-up play. Rooney has also worked alone up front and in tandem with David Goodwillie, whose presence in the squad has undoubtedly been a factor in the striker's consistency. Above all else, though, Rooney is a finisher. He has a striker's instinct for being in the right place at the right time, and he has scored with a range of finishes: from close in, from afar, with his head. For a team that has performed admirably, Rooney has been the most prominent figure. There was no doubting Gordon's quality but there was still an element of risk to his signing last summer because he had been out of the game for so long. Injuries blighted his career, but his recovery is complete and he has become a vital player for Celtic. His shot-stopping remains excellent and he has a natural command of his area. Calmness under pressure and a refusal to allow rare misjudgements to affect his form mean that Gordon has returned to the top level of the game with barely any period of readjustment. He is playing behind the best team in the country - in particular two accomplished centre-backs - but that brings its own demands since he has to maintain concentration throughout games. Being recalled to the Scotland squad and some outstanding performances in Europe have been the other notable occurrences in a season that has deservedly seen Gordon acclaimed again. Could legitimately lay claim to being the best player in the league in terms of ability and also the best performer over the course of this season. Johansen has grown in stature and the Celtic manager Ronny Deila considers him so important to his side that he is rarely afforded a rest. The Norwegian midfielder combines remarkable stamina with stealth, and an ability to gracefully deliver the ball into dangerous areas. 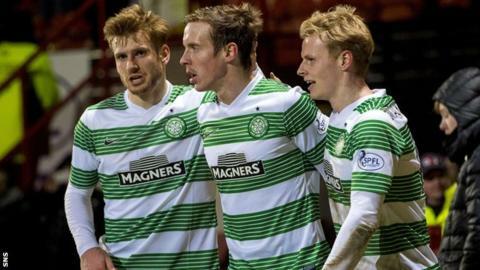 Johansen has become integral to Celtic because he sets the tempo and tone of the team's displays. At Stromsgodset he played as a deeper lying midfielder, but he is at his most influential in a more attacking role, flitting around the final third and providing a cutting thrust to Celtic's play, but also endlessly willing to chase back and harry opponents. He creates, and he might score more goals, but he also grafts; and he can command games with the deftest of touches. Stewart's goals have been vital to Dundee - only Rooney has scored more in the league - and he has impressed with his all-round play. The performances are even more impressive when perspective is applied, since this is not only his first season in the top-flight, but his first as a full-time professional. Stewart spent the previous four seasons at Cowdenbeath, eventually forming an impressive partnership with Kane Hemmings that helped the club avoid relegation last term. He admits to having taken time to adjust to the physical demands of training full-time, but patience was worthwhile for Dundee manager Paul Hartley because Stewart's goals have directly earned several points this season for the team. At 25, he is young enough to still improve, but it is clear that Stewart, a bright, sharp striker, is capable of scoring at the highest level in Scotland. The United manager Jackie McNamara has described Ciftci as the best player in the league. He can be allowed an element of hyperbole, since his job is to motivate and cajole the best out of the striker, but Ciftci's talent is clear. A strong, robust frame and a fiercely competitive edge allow him to hold his own physically, although a lack of self-control has been evident at times. Yet Ciftci's effectiveness is not just about his brawn, he is also quick and skilful, and often contributes to build-up play as well as looking to provide the clinical finishing touch. Following the departures of Gary Mackay-Steven and Stuart Armstrong, Ciftci has become the team's most important player, but the responsibility has not fazed him and he has continued regularly scoring goals for a United side that has been struggling. A modern-day full-back who is just as comfortable surging upfield to join in attacks as he is in carrying out his defensive duties. Shinnie is as skilful and elusive as a winger, and his crossing provides a regular supply of chances for his teammates. He is increasingly sound as a defender, but at his most composed and exhilarating on the ball, not least because his manager John Hughes urges both of his full-backs to try to overwhelm opposition teams on the flanks. Shinnie is athletic and industrious, with enough stamina to continually run up and down the left flank, combining defence and attack. He has grown in composure, experience and influence, persuading Aberdeen to sign him on a pre-contract agreement. He will be sorely missed by Inverness.